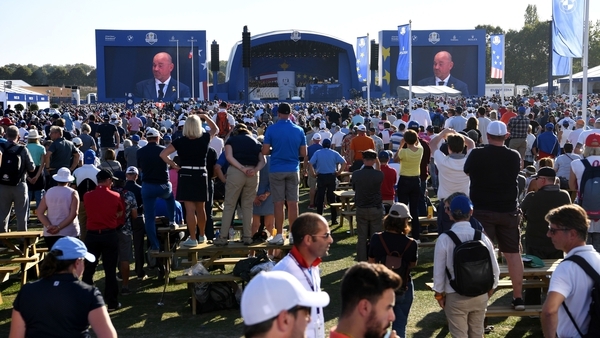 Europe's 10-6 overnight lead meant they needed just four and a half points from the 12 singles matches for a ninth win in the last 12 biennial contests, but Justin Thomas gave Jim Furyk's side an early boost with victory over Rory McIlroy in the opening match. Fleetwood 6&4, the gap was down to a single point and American hopes of a repeat of the comeback at Brookline in 1999 were very much alive. However, Thorbjorn Olesen, who was left out of Saturday's action by fellow Dane and Europe captain Thomas Bjorn, then thrashed three-time major winner Jordan Spieth 5&4 and Rahm picked a perfect time to win his first match and leave Woods without a single point. "There is a lot going on for me right now," Rahm said. "The memory of Seve (Ballesteros) and my grandpa, who would have loved to be here, who passed away at the (US) PGA. "To beat Tiger, one of the all-time greats, if not the greatest, on the Sunday, at a pivotal point, it is the best feeling of my life." With several matches on the verge of finishing in Europe's favour it was just a case of who would secure the winning point and Ian Poulter took his side to the brink of victory by beating world number one Dustin Johnson on the 18th. Alex Noren, one up playing the last, was facing losing the hole after DeChambeau hit his approach within 18 inches but the Swede sank a superb 30ft putt for an equalling birdie to win one up. 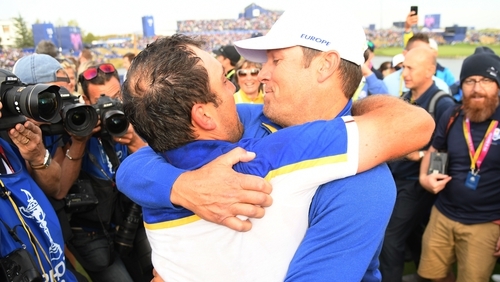 Molinari, who became the first Italian to win a major championship in July's Open at Carnoustie, said: "It means so much, more than majors, more than anything. It's hard not to get emotional. Bjorn added: "They have been amazing, the 12 of them, unbelievable. They were determined to set out and do the job themselves and for me it was an easy job to guide them in that direction. "Experience when you come in with the right attitude produces special things. "It was getting tight a little bit but I had belief and faith in this team that they were going to deliver and they delivered more than they should have." United States captain Jim Furyk admitted his team had lost to the better side. "At the end of the day you have to tip your cap, they outplayed us this week and Thomas was the better captain," Furyk said. "I love these 12 guys. It was an honour to serve as their captain."